Place onion in 4- to 5-quart slow cooker. 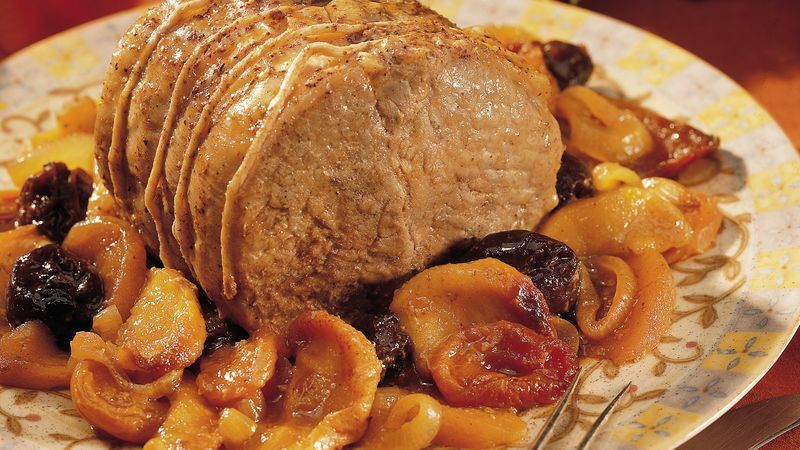 Place pork on onion; top with fruit. Mix remaining ingredients; pour over fruit. Cover and cook on low heat setting 7 to 9 hours or until pork is tender. Serve fruit mixture over pork. Note: This recipe was tested in slow cookers with heating elements in the side and bottom of the cooker, not in cookers that stand only on a heated base. For slow cookers with just a heated base, follow the manufacturer’s directions for layering ingredients and choosing a temperature. Apple juice enhances the flavors of the dried fruit and pork. You can also use apricot nectar or orange juice. Check that the package of dried fruit contains large pieces of fruit, such as slices of peaches, apples, pears and apricots. Diced dried fruit is also available, but the pieces are too small, so they overcook and become part of the sauce during the long, slow cooking.